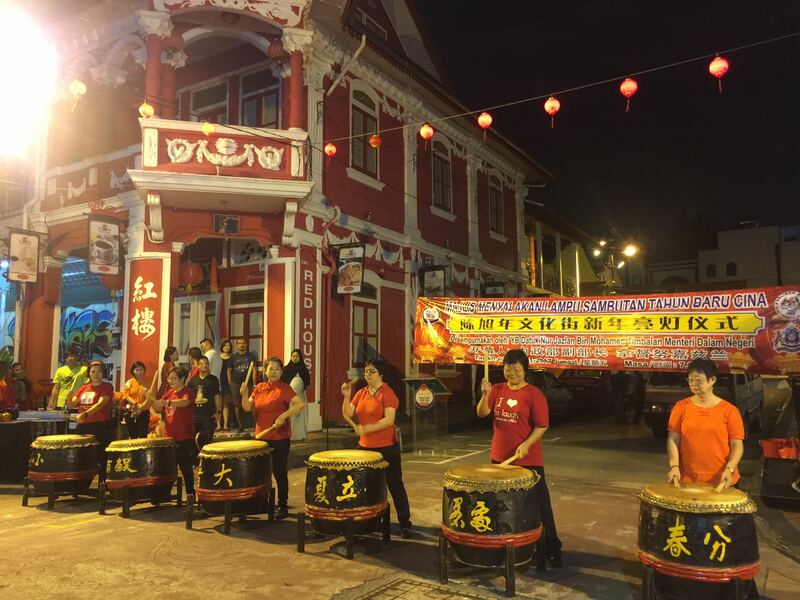 On January 22, the Sunday edition of Sin Chew Jit Poh, Chinese newspaper featured a photo with the report on the Light-Up ceremony at Tan Hiok Nee Heritage Walk to kick-off the Chinese New Year celebrations in Johor Baru’s heritage quarter. 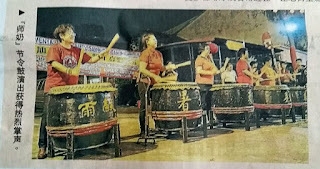 The photo showed six women drummers beating Chinese drums in the 24 Festive Drums’ art of drumming and I recognized them as members of the JB Befrienders. 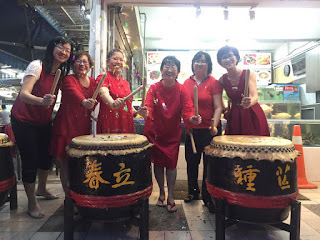 But I know the lady drummer, second from left, is not a member because she’s my friend, Jennifer Liew, who was “adopted” by this drumming group about seven weeks ago. To answer this question, let me share with you her inspirational journey that brought Jennifer to where she is now. Left] Can you spot her "third leg"? 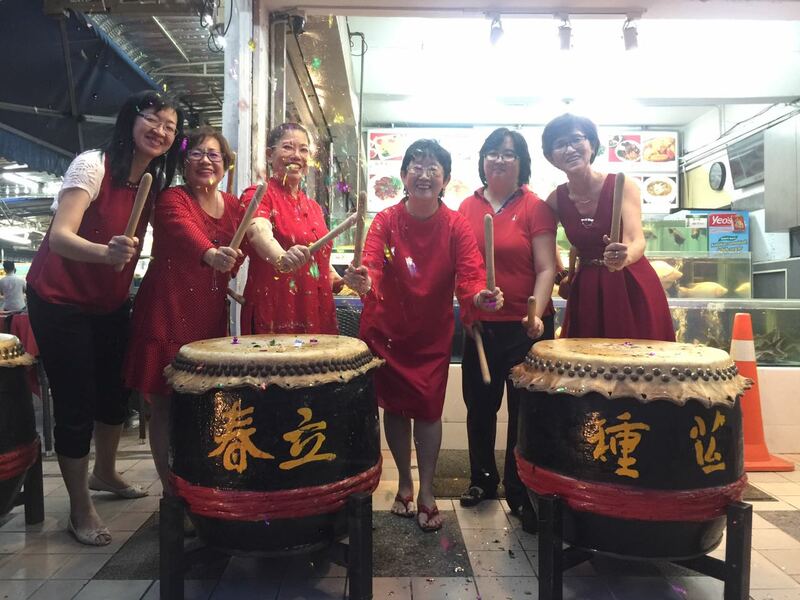 In the 1990s she had the opportunity to watch the Foon Yew High School drum troop performing the 24 Festive Drums and this dramatic performance sparked off her dream to learn this art of drumming. Jennifer grew up on Jalan Tan Hiok Nee, where her family once lived in the block closer to the OCBC Bank, and from the tender age of eight, Jennifer’s other dream was to travel the world. When she turned 21, her dream to travel was realized when she joined Cathay Pacific Airlines as cabin crew and this career took her around the world. She was then based in Hong Kong and was back in JB only for family visits. When she decided to quit flying, she joined the world’s biggest event company and applied herself to organizing world-class events, learning, growing and investing in personal development programmes and life skills. With her base in Kuala Lumpur, Jennifer continued to travel the world to attend events, take care of invited speakers and organized everything from A to Z to ensure that public training programmes and seminars went on without a hitch. In April 2014, Jennifer discovered that her vision was impaired and diagnosed as suffering from Macula edema. She underwent a series of eye laser treatments and even after seven injections into her eyeball, her vision remained poor. While she was driving on the way to a meeting in KL, Jennifer was involved in a motor accident. Her car was a wreck but thankfully, she was not seriously injured. Then she moved back to JB to rest and recuperate, and that was when we reconnected again. Jennifer and I share some things in common. Not only are our parents acquainted, two of our older sisters were classmates while we too were also classmates in the Johor Baru Convent. When Jennifer was admitted to Hospital Sultanah Aminah (HSA) in Jan 2015, it marked the start of her failing health. With her unstable health, she was in and out of the hospital but throughout her treatments, she remained cheerful and positive. It took some time but she recovered well and I remember the dinner celebration her husband hosted to celebrate her birthday in Aug 2015. When Jennifer was again admitted to HSA on 2 May 2016, none of her friends were aware of it. In her previous hospital admissions, she would send us a text message to let us know that she was resting there. But this time, she was just not up to doing that. My eldest sister, who are friends with her eldest sister, received a message from the UK, where she lives, telling her to inform us. As soon as my sister told me, we rushed to HSA to see Jennifer. By this time, she was already in the Intensive Care Unit (ICU) of HSA. I can never forget the sight of her, lying pale and inert, intubated and on life support. Her heart was swollen and had two leaky valves, she had suffered renal failure and her major organs had started to shut down. Of course Jennifer had no memory of the time she was lying in the ICU but her brother told her when she was admitted with breathing difficulties, she was transferred to the Red Zone where a cardiologist treated her and put her on oxygen. At that time, there was no vacancy in the ICU and to keep her alive, a nurse helped her to breathe by using a manual pump until she was moved into the ICU. It was May 10, when she was finally out of the ICU and moved to the normal ward. But after being so ill, Jennifer was incoherent and had no idea of what happened to her. Jennifer was diagnosed with renal failure and needed to undergo regular hemodialysis. To start this treatment, she had surgery with a Nephrologist to fit an AV fistula (AVF) or arteriovenous fistula on her neck. After a series of blood transfusions, scans and heart monitoring, she was discharged from HSA on May 14. Then she started her first dialysis treatment on May 15 at the Landmark Dialysis Center with a three times, 4-hourly treatments, per week schedule. Meanwhile, she consulted Dr Angamuthu for a further surgery to fix a permanent access for dialysis and it took two operations over a period of a month to complete the AVF and brachiocephalic fistula or BCF, in the vein on her right arm. She continued to use the neck AVF for dialysis for two more months before the new AVF and BCF surgeries healed properly and were ready for use. After using the AVF and BC fistula for two weeks, the neck fistula was removed. Meanwhile her application to the Rotary Club of Johor Baru’s Hemodialysis Center submitted in May, was finally approved and she started treatments here in Aug 2016. It was a series of tremendous challenges but Jennifer gradually learned to cope and adjust to a lifestyle change and worked hard at getting her strength back. She drew on her past experience from her flying days, being a host on the flights, managing the crews and passengers – and later, in leadership roles and developing herself with the events company – all these experiences helped her to deal with her life-changing experience. Physically, she may look fine but her vision is that of a visually impaired person and yet she’s not qualified to be certified blind. Sometimes, friends may wave and smile at her but she will not respond because she cannot see them. At meal times, she may need to ask, “What is this?” or “What is that?” and she is aware of how irritating it may be to others who don’t have poor eyesight. Jennifer recognizes that she is no longer independent or self-reliant because her low vision has limited a great deal of her normal activities like reading, cooking or sewing. Now it’s impossible for her to read the labels on sauces or ingredients on food packs, not even the price labels if she went shopping… and doing many things that sighted people often take for granted. Her walking is also limited but she knows that physical exercise is important. She uses a walking stick to help her maneuver around on uneven ground, steps or curbs, gauge the ground level and try to avoid tripping. As Jennifer established a regular routine of undergoing dialysis three times a week and making the effort to eat a healthier diet, she regained a measure of stable health. I remember she told me about her desire to learn to play the drums but I didn’t broach the subject until she was physically stronger. While she was resting at home, she may have read some of my stories on the 24 Festive Drums and then she was hooked! She was simply fascinated and so proud that this art of drumming was started not in China, Japan or Korea but in our very own Johor Baru! When she read about the International Drum Competition planned for Sept 17, she asked if I was going and as I replied “Yes!” I also invited her to come with me. I also invited Elizabeth Chan, another former classmate, to join us because I needed an extra pair of hands to help with Jennifer at the event held at EduCity stadium, Iskandar Puteri. The drum show so inspired Jennifer that it revived her interest in taking drum lessons. Meanwhile I was observing how she was gradually improving in health and when the JB Arts Festival rolled around, I invited Jennifer along to enjoy some of the evening shows. I also went to the Drums Café to meet with drum master, Lee Sheah Liang, and told him about Jennifer’s desire to learn to play the drums. I filled him in about her physical limitations and health conditions and was grateful that he was ready to accept her into a basic level class to start drums lessons there! Can anyone recognise this "Mona Lisa"? I hugged this info to myself and wanted Lee to tell Jennifer the good news when they met. I then arranged for her to attend a drum demo and street show in one of the Arts Festival programmes where she should meet with Lee. And when they did, she enrolled for classes immediately! I can still remember that day in Nov 2016 when Jennifer went for her first drum lesson. She was at Jalan Tan Hiok Nee for breakfast with her husband and sent me a text message, sharing her excitement as she eagerly anticipated going to her first class! Lee was kind enough to offer a place to her in an ongoing class with the Befrienders group who kindly “adopted” her since Dec 2016. While she was glad to continue her lessons, she felt as if she was thrown into the deep end because she was way behind them in lessons. But she was determined to catch up. So it was a dream come true for Jennifer to perform with the women drummers at the Chinese New Year event this Jan, held on the very street where she grew up – Jalan Tan Hiok Nee. But that’s not all. "Yes, it is a dream fulfilled and I look forward to becoming skilled at this art of drumming. I've travelled round the world in my career and now its time to serve my hometown, even in my current capacity," said Jennifer. She may have lost some eyesight but she still has vision in life and knows what is possible. Over the many years of her career with the airlines and in the seminar industry, she has learnt to listen to unspoken words, deal with situations and find solutions. These valuable experiences are helping her cope with her life-changing experiences. “Yes, it can be very frustrating sometimes but I have become more self-loving, learnt to appreciate myself and often try to make things happened for me,” said Jennifer. That photo with Jennifer drumming with the group published in the newspapers, is a major milestone for her and most encouraging and inspiring. I sent messages to congratulate her and Lee, her drumming master, and knew that I must share her story. Jennifer has certainly travelled a grueling journey and fought her way back to be on her feet again. She’s truly an inspiration to all of us. So as we wish each other Happy Chinese New Year, let us not only wish for abundant wealth, good fortune and prosperity but also wish for good health and strength. Kongxi! Kongxi! Aware that diners may wish to enjoy a relaxing festive meal at home but don’t want to miss out on the prosperity Yee Sang dish, Hotel Jen Puteri Harbour offers Yee Sang on-the-go in convenient takeaway platters. To brainstorm on creating Yee Sang platters with a difference, Executive Chef Amirudin Jaafar called together his culinary team led by Chinese cuisine sous chef, Chua Jin Hong, weeks ago and they worked hard to present an exciting Yee Sang menu. Yee Sang, the Cantonese phrase which literally means raw fish, is a salad created by four local chefs in Singapore as a symbol of prosperity and good health for the lunar new year back in 1964 when Malaysia and Singapore was still one country – Malaya. It was a dish designed for businessmen who wished to toss the salad to great heights, an act which is believed to augur well for greater prosperity and wealth in the coming year. As such, this activity is known as Lo Hei or a prosperity toss! Originally, Yee Sang was eaten on the seventh day of the first month in the new lunar year but now, due to its popularity, many restaurants serve this dish throughout the festive season. Chef Chua is rather modest about the range of Yee Sang that are artfully presented in various interesting sculptured designs. When asked which is his preferred choice? He replied without hesitation, “Alaskan King Crab!” That’s because in Johor, it’s only available from Hotel Jen Puteri Harbour this festive season. In a preview of the five varieties of Yee Sang, I had the privilege to watch how the chefs arranged the base items on the platter and then added the high-value ingredients as its distinctive topping. While Yee Sang platters usually use fish like wolf herring, the two types of fish offered here are Salmon (RM 88) and Tuna. There is even an option for Vegetarian Yee Sang topped with luxurious slivers of Korean Snow Pear (RM88). Diners may choose from the above two base platters priced at RM88 each and add-on luxury ingredients like 160 gm of King Abalone Slices (RM168), 220gm of Alaksan King Crab meat (RM78) or 300 gm Maguro Tuna slices (RM38). All prices are quoted nett, inclusive of 10% service charge and 6% GST. From now to Feb 15, diners may place their orders for takeaway Yee Sang with On-The-Go, at least three days in advance and pick up from their outlet at the hotel’s ground floor. Fans of Hello Kitty can now enjoy a complete experience with their favourite furry friend when they stay in the Hello Kitty themed rooms at Hotel Jen Puteri Harbour, visit Sanrio Hell Kitty Town and dine at Hello Kitty Red Bow Café. Twelve distinctly Hello Kitty themed rooms, the first of its kind in the South East Asian region, were unveiled at Hotel Jen Puteri Harbour, Johor, recently to give fans of this iconic kitten a complete Hello Kitty experience in one destination. Hotel Jen Puteri Harbour, in partnership with Sanrio Hello Kitty Town, designed an entire section on level three with deluxe rooms and premier suites in three Hello Kitty themes based on the swashbuckling Sailor, the romantic Pink Series and magical Hello Kitty in OZ. Designed to spark guests’ imagination, the cool blue Sailor Hello Kitty rooms with nautical inspired details, enjoy a harbour view while the Pink Series rooms are all sugar and spice for a rosy getaway. Meanwhile, the Hello Kitty in Oz themed rooms aim to transport guests to a magical place where Hello Kitty takes on the mantle as the Great Wizard of Oz. “With the launch of these themed rooms that come with Hello Kitty in-room amenities, unique designs and colourful illustrations to suit different moods and tastes, Hotel Jen Puteri Harbour is the perfect destination for fans of Hello Kitty,” said the hotel’s General Manager, Paolo Campillo. The premier suites are also furnished with themed bunk beds in an adjoining room to the master bedroom and just right for families with young children. A third bunk bed with the double-decker! All rooms come complete with Hello Kitty amenities including stationery, specially embroidered bedroom slippers, towels and bathrobes. “As Puteri Harbour is developing as a premier destination for families to play, dine, stay and explore, we aim to give guests a 360-degree experience with the Hello Kitty themed rooms located just steps away from Sanrio Hello Kitty Town and Hello Kitty Red Bow Café,” said Chief Marketing Officer of Themed Attractions Resorts & Hotels, Philip Whittaker. He is confident that the attractive rooms and themepark package will give business travellers reasons to bring their families along on business trips to Johor and extend their stay to spend quality time with their families in an exciting Hello Kitty experience. Rates for the complete Hello Kitty experience start from RM800++ per room per night in a package which includes breakfast, a welcome pack filled with Hello Kitty premium items and complementary access into the Sanrio Hello Kitty Town themepark. Situated at scenic Puteri Harbour, Sanrio Hello Kitty Town and Thomas Town are at the hotel’s doorstep while Legoland Malaysia Resort is just a short drive away in Iskandar Puteri. Flashback: My phone is ringing and as I reach for it, read that it’s the JB Bureau chief who’s calling. “Hello, what's up?” I greet him cheerfully. Being the busy man he is, Fairuz plunged into the subject right after the initial greetings. He asked if I can cover an event at Legoland Malaysia Resort and I replied, saying that I had already accepted their invite and was going to attend the launch of Ninjago, the Ride. “Good!” he said with a sigh of relieve. I told Fairuz that I was going to witness the exciting launch of the all-new Ninjago, the Ride event and write a story for Life & Times Travel, now called Jom! This is a much anticipated happening at the resort and I’m not going to miss it. Then Fairuz set me straight. He said I’m to do the story for LET and not Life & Times. 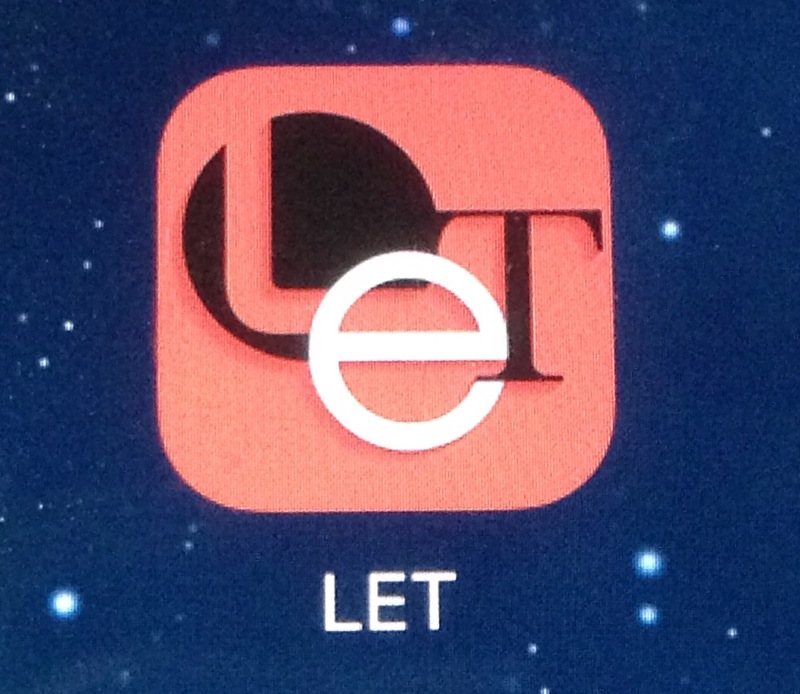 Maybe I’m just too buried under with working on my Johor stories that I missed out on the recent launch of LET. So he explained that this is a New Straits Times online magazine accessible through an application for smart devices called, Leisure, Entertainment and Travel = LET. And its free-of-charge. After we discuss the story guidelines, he directs me to the LET editor for further details on the submission deadline and procedure. Before doing anything else, I quickly downloaded the app for LET to experience the convenience of reading the online pages. Fast-forward to the exciting event, touted to be the grandest since the official opening of the resort in 2012. On that bright and sunny day, the media – from throughout the region – turned out in full force. Together with die-hard fans of Ningago from Legoland Malaysia Resort’s annual pass holders and their families, the crowd swelled as the temperature rose in the afternoon heat. Always a good host, the resort had a buffet spread designed with Japanese themed snacks and desserts to keep everyone comfortable while waiting for the VIPs to arrive and the event to start. The official launch programme kicked off on the arrival of VIPs, Interim General Manager, Legoland Malaysia Resort, Young Pil-Kim; Chief Marketing Officer, Themed Attraction Resorts & Hotels Sdn Bhd, William Edwards; Yang Dipertua, Majlis Perbandaran Johor Bahru Tengah, Dr Badrul Hisham Kassim; Director of Tourism Johor, Mohd Gadaffie Abdul Aziz; Director-General, Tourism Malaysia, Datuk Seri Mirza Mohammad Taiyab; Director of Sales & Marketing, Legoland Malaysia Resort, Thila Munusamy; Chief Executive Officer (Attractions) and Themed Attraction Resorts & Hotels Sdn Bhd, Phillip Whittaker. We wait with bated breath as the drums thundered in a dramatic performance and the audience watch as Master Wu, the distinctive Ninjago character, walks onto the Ninja Training Courtyard, to perform a pantomime and introduce the mission of the ninja heroes. The two MCs, speaking in English and Mandarin, cautioned the audience not to try this at home just before the four Ninjago young ninja heroes – Kai (Fire), Jay (Lightning), Cole (Earth) and Zane (Ice) – burst onto the courtyard to demonstrate their elements in a series of stunts in the ancient martial art of Spinjitzu. Local child celebrities dressed as young ninjas, Bryan Herbert, Blair Herbert, Puteri Balqis, Mia Sara, encourage guest volunteers to join in a few games to sharpen their skills in throwing the shuriken and wielding karate chops before being welcomed into the Training Temple to face enemies and the Great Devourer! I watch all the activities with interest as I eagerly anticipate being among the first in the region to have my own Ninjago Ride experience. When the time came, the VIPs and annual pass holders went ahead for the first rides while I enjoy a few sips of chilled Japanese green tea before I take my turn to step into the Training Temple. Check out my contribution in January 2017 LET issue Number Eight, under Destination: Lego Ninjago Characters Come To Life. What are you waiting for? Go on! Download the app now! Twelve months has passed. Someone is missing. And this was felt by everyone in the family, each in our own way. It was the most difficult twelve months for me and even though I told myself, “I’m not counting,” I couldn’t help marking the days and dates, the birthdays and anniversaries and feeling dad’s absence acutely because he was a major part of my life. On dad’s birthday, my brother posted his date of birth in Facebook and one of the comments received from a naïve friend was a question if it was a 4-D number. He clearly couldn’t count because a date of birth was certainly more than four digits! On the first anniversary of dad’s passing, my brother posted a photo that I took of the three generations of Loh men – dad, my brother and his son – while they were in the swimming pool at Cinta-Ayu Suites, Pulai Springs Resort, on Christmas Day 2015, just weeks before dad left us on 17 January 2016. This photo of dad, then aged 93 – who swam a few laps in the pool – was a reminder of how vibrant he was and the way he taught us to swim at the beach in Kampung Pasir Gudang, long before it was turned into Johor Port. Every time I look at dad’s empty chair, I miss his presence, his words of encouragement and his quiet pride when he reads the articles with my byline. While dad clearly supported what I do, he refrained from showing favouritism. He was just honest and caring, polite and undemanding. A further insight into dad’s upbringing and the kind of person he was, was his sense of courtesy. In the Asian context where our elders expect us to jump to their requests and do it out of filial piety and duty, I observed that dad as a father, NEVER took for granted that he need not say “Thanks” to his children for doing simple tasks for him. No, I don’t need any psychoanalysis to help get me through the difficult patches because it’s a natural process of coming to terms with the changes and I’m dealing with it at my own pace. Losing dad was like cutting out a huge chunk of my heart and it will take time to heal while I go about the business of living and doing all that I know he would be proud of. For me, it’s therapeutic to talk about it rather than keep it bottled up inside and writing about dad is my way of dealing with it. I can remember almost every detail in the chain of events that started when dad collapsed with an acute stroke on Jan 14 last year but this question simply drew a blank! It was an emotional time for all of us, making decisions and arrangements for the wake services and funeral, and one year on, they are wondering what we ate that night. Enjoying good food was one of the fun things we did with dad so during the few days of dad’s wake, we decided to eat the food that dad enjoyed as a tribute to him. Of course, we did not order in stir-fried crabs – the blue (flower) type – which was dad’s preference to the more fleshy mud crabs, or dad’s preferred choice of chicken cooked in Chinese rice wine, as it was inconvenient and inappropriate to eat these at the funeral parlour. I tried to jog my memory in an attempt to answer my brother’s question but all I remember was feeling numb and going to the funeral director with the selected set of clothes to dress dad in but what happened next was a total blank. After asking around among our church family who were with us throughout those eventful days, we finally got the answer: Sing Kee restaurant at Melodies Garden. And they even remembered the dishes ordered in honour of dad including his favourite, sambal petai! One of dad’s favourite noodle choices was the Teochew fish noodles by Leong Kee at Jalan Storey. Since discovering it, dad always recommended it to friends and family. When our uncles and aunts visited us, dad suggested that we lunch out at Leong Kee with them and it pleased him very much when they agreed with him that they too approved and appreciated the taste of these noodles, served in a rich fish broth. Dad never said “No” to this comforting bowl of rice noodles in fish soup so very often I would tah-pau or buy takeaways for dad to enjoy a satisfying soft meal at home or when he was recuperating from some chest infection in hospital. When we dine with dad at various cafés and restaurants, and ordered mushroom soup, dad always compared it against the mushroom soup at Niniq Bistro. That was because the mushroom soup at Niniq so pleased dad that it became the benchmark by which he compared with any others he tasted. “Shh…!” I tried to hush him but it was too late. It was just like dad to speak his mind, much too loudly sometimes. He would just say it quite spontaneously because to him, nothing compared to his favourite taste of mushroom soup at Niniq! At Niniq, dad’s usual order was mushroom soup with a grilled chicken sandwich. In the early days, Niniq used to serve this sandwich, made with focaccia bread, sliced into halves. We would always ask the staff to slice the halves into quarters because it was easier to handle and dad usually ate only three quarters of the sandwich. I don’t know if it was because of our regular request but since then, Niniq continued to present their grilled chicken sandwich cut into quarters. I remember how we enjoyed a Caesar Salad together and when dad crunched into a bite, he would comment that it would taste better with Thousand Island dressing. And we would roll our eyes and explain to dad that Caesar Salad comes with a cream sauce and not Thousand Island. It’s a different recipe so try to enjoy it, please? This happened often during a stage when dad favored the taste of Thousand Island salad dressing so we used to joke about bringing a bottle along whenever we dined out so that we have a ready supply to please him. Aware of his preference for Thousand Island sauce, we always kept stock of it at home but in the months prior to his departure, he no longer asked for it. Taking dad out for meals was very much part of our lives and to commemorate the first anniversary of dad’s departure, we decided to celebrate his life by eating some of the food that dad so enjoyed. Our lunch and dinner that day was more meaningful when it was shared with the church family who also have fond memories of him. As May used her chopsticks to lift her noodles out from the bowl of steaming fish broth to cool, she said each time she and her sons ate at Leong Kee, she couldn’t help reminding them that this was one of Uncle Loh’s favourite noodles. The food was good even though we had a bittersweet time in his memory as we recalled dad’s idiosyncrasies and his wacky sense of humour. While our aunts were not present with us that day, Aunty Polly (on holiday in the UK) and Aunty Sylvia (in KL) were with us in thoughts as they sent sweet messages with comments and memories of their experiences with dad. We recalled how unsuspecting phone callers to our home would be shocked when dad picked up the phone and greeted them, “Vanakkam!” [This is the Tamil word for Hello, Hai or Welcome] Very often, they panicked and hung up quickly, thinking that they called a wrong number! If they ventured to call again, dad may pick up the phone and put them out of their misery by not only saying, Vanakkam but follow up with asking, “Who’s calling?” so that the caller may identify himself and go on with the conversation. Regulars soon caught on to dad’s way of answering the phone and they would cheerfully reply with their own, Vanakkam, and chat with him before asking for mum or me. Dad already had working knowledge of spoken Tamil and with a passion to learn to read and write the language, he would take every opportunity to practice his Tamil! Dad’s absence is going to be felt acutely at every celebration and anniversary but we praise God for dad’s life, his testimony and the legacy he left with us. I’m sure dad would have approved of how we remember him, even as he lives on in our hearts. While it was just another day on the calendar, it was significant for us as we cherish our thoughts and memories. The first year is over. I hope the next twelve months will rush pass again. Maybe, just maybe it might pass with a little less pain.